The Monrovians had failed to breakout north to Einhaus and had retired back to Kleinhaus and prepared to withdraw to Vanderhof. In the north at Weingartstadt on the River Oudear (north of Hausdorff). General Zeinite and the Monrovian army of the North had attempted a river crossing. As they had just finished their bridge of boats and were starting to cross with their ordnance they were attacked by the Wittenberg Ostenland corps (sometimes know as the reserve corps). The battle resulted in a defeat for the Monrovians and they were forced back across the river taking heavy losses. The Boldovian corps of the Wittenberg army had taken Vanderhof and was now scouting forward to OberStein. General Stricknein withdrew the Monrovian army of the East to Oberstein and as the advance guard started down the road to Vanderhof they were met with a by an Officer of the garrison who had escaped capture and told them that the Wittenberg army had taken Vanderhof. The Monrovians were outnumbered and effectively surrounded by the Wittenberg army; the Guard corps was in the their rear; the Wittenland corps on their left flank; the river Oudear on their right flank and the Boldovian army corps to their front. With no pontoon equipment and practically out of supplies and ammunition General Stricknein surrendered his bedraggled army. The Monrovian fortunes had reached a low point. Their army of the North was in disarray after their defeat at Weingartstadt while crossing the river Oudear and their army of the East had surrendered at OberStein. In no way able to make up the losses in men and material the King of Monrovia entered into negogiations for peace with Wittenberg. b) Both sides to remove all troops from Lower and Upper Belgravia, in future only a border watch or corps of observation would be permitted to a maxium of 1,500 men. c) Monrovia to pay Wittenberg 10,000 florins in reparations. d) Saxe-Jarslberg to cede the region of Hofland giving Wittenberg control of both sides of the river Oudear at Vanderhof. The peace was signed at Witzend, supervised by diplomats from the Imperium. Well its the end of the 3rd Belgravian wars, more from the history of Wittenberg to come ? I expect so, Brother James is busy with his researches .. I will be putting the whole of the 3rd Belgravian wars into a PDF file, piccies will link to those in the BlogPosts. Making the Palace Interior (4) - Planning the room..
a. Write out a list of features for the room. b. 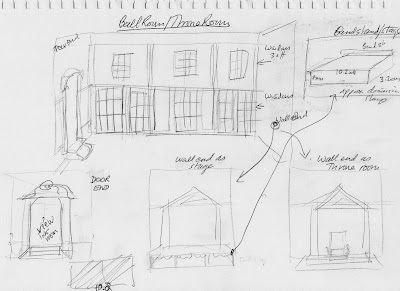 Sketch a view or views of the room, with some ideas jotted on it. c. If needed draw plans of sections which require it with measurements, to enure you cut the parts up right for assembly. I've started keeping a modelling ideas book, so I can jot/sketch things in as they come to mind. This is the room I'm currently working on, the basic room is done and I'm in the process of finishing it off, so any preferences as to which guise you would like to see it in first ? Ballroom or Throneroom. Before tidying away the scenery from my last ECW game I decided to re-use the scenery to setup the troops for Saxe-Jarlsberg (Wittenbergs opponent in the border wars to the south-west). Currently have 3 battalions infantry, jager company,12 figs of cavalry and 1 artillery piece. General Stricknein looked at his orders which the courier had just delivered from General Zeinite. He was ordered to move north and to join with the army of the Centre, who would be crossing the River Oudear; he doubted the effectiveness of General Zeinite and didn't expect him to get across the river quickly. After getting reports of the dispositions of the Wittenberg Guard Corps, he decided that it was at least possible to breakout north to Hausdorf up the road thorugh Einhaus; well he thought I can try and if all else fails we can retire back across the river at Vanderhof into Saxe-jarslberg. General Stricknein, wrote out orders and ordered Von Rappnov to get the army ready. His aim to attack and take Einhaus and move up the road to Hausdorf and then north though the hills to meet with the Army of the centre. Between two areas of dense woodland the road to Hausdorff went through Einhaus. It was here that General Waldebeck stood his troops to early in the morning. The troops available to him were one battalion of militia and two elite battalions - the Gardes Suisses and the Kurprinzessin Grenadiers; plus the guard bombardiers and their heavy mortars. He was concerned that the militia would not stand their ground. If attacked he knew he could hold long enough for the foot guards and guard cavalry to come to his aid. General Waldebeck peered through his telescope and saw the Monrovians spilling out onto the plain in front of Einhaus; his main concern was the large body of infantry moving in his direction. The Monrovian infantry form up for the attack, presenting a daunting spectacle for the defenders, the militia find their nerve and stand as the Kurprinzessin Grenadiers move into position. The guard bombardiers let loose with the heavy mortars but with little effect. On the left the Garde Suisses let loose a ferocious volley which decimated the leading Monrovian battalion who routed. On the right the milita rout after an exchanging of vollies ..
On the left the Garde Suisses move forward and fire on the next Monrovian battalion who disorganised and unnerved by the troops routing through them also rout. On the right the Kurprinzessin Grenadiers and lead Monrovian battalion start a firefight. On the right the firefight is lost by the Monrovians who rout back through the supporting battalions ..
General Waldebeck held his ground and watched the Monrovians retire, he had successfully beaten off the attack. In the distance to his left he could see troops in action, he hoped the Guard cavalry were giving the Monrovians a taste of cold steel. After finishing the chasseurs, I took the opportunity to lay the whole of my 40mm Freikorps out on the gaming table - nice to see a project completed - it comprises: a regiment of Uhlans, battalion of grenadiers, battalion of chasseurs and a company of jagers. I will be adding a battalion of regulars later, which will complete the Wittenberg forces (in 40mm) for the Saxe-Jarlsberg border wars.